This article is about the story arc. For the location, see Noah's Virtual World. 121: "Burying the Past - Part 2"
Story 4: Virtual World (Ｓｔｏｒｙ（ストーリー）４ バーチャル世（せ）界（かい） Sutōrī Shi: Bācharu Sekai) is a story arc in the Yu-Gi-Oh! anime. The arc does not appear in the manga. It is sometimes referred to as The Noah Arc or Noah's Arc, by fans and by 4kids Entertainment. In the English dub, this arc and Battle City part 2 are referred to as Enter the Shadow Realm. Originally created in order to allow for more distance between the anime and the manga, the arc bisects the Battle City story arc and serves as a side adventure for the protagonists. Many of the characters introduced in the Battle City arc, however, appear only in a minimal role. The large majority of the story arc revolves around a new gameplay element, which is created specifically for this story arc, known as the "Deck Master". In these Duels, each player would select a Deck Master, which begins the game outside of the playing field. Each Deck Master has a unique special ability, which can be used at any point in the Duel as many times as desired. It is to be noted that even Deck Masters which otherwise have no special abilities (such as Normal Monsters) have a special Deck Master ability. As well, it appears that some Deck Masters retain their normal special abilities to be used as their Deck Master abilities, such as "Jinzo's" ability to negate all Trap cards and Nightmare Penguin's ATK increase of all WATER-Attribute monsters. The Deck Master can also be specially Summoned to the field, without any prerequisite such as Tributes, Fusions (for Fusion Monsters) or rituals (for Ritual Monsters). However if the Deck Master is destroyed, its controller automatically loses the Duel. If the Deck Master is itself Tributed or otherwise replaced, the new monster would become the new Deck Master, and the old Deck Master's abilities were lost (in theory, the old Deck Master could be returned by normal means - but without the Deck Master abilities, although this point is not elaborated upon in the story arc). It is not explained how a monster that cannot be specially Summoned, or a monster that can only be Summoned in a special manner (such as "Fusion only") can be designated as a Deck Master, as no such monster was used as a Deck Master in the story arc. It is also not known whether a Deck Master card counts as against a Duelist's main (or Fusion, if the Deck Master is a Fusion monster) Decks, as this concept is not elaborated upon in the anime. When a member of Yugi's group Duels in this Virtual World, he/she is given a Duel Disk by their opponent, and they must build a new Deck. The Virtual World arc can be seen as a sequel to the Legendary Heroes arc (episodes 43-45) as it features The Big Five looking for revenge within a virtual reality system similar to the one they were defeated in. Aboard Seto Kaiba's airship, the eight Battle City finals Duelists prepare to head for Alcatraz (KaibaCorp Island in the English dub), the site of the semifinal and final rounds of the Battle City tournament. However, the trip takes a mysterious wrong turn, and finds itself landing in an undersea fortress - apparently, a mysterious force is set on revenge against Kaiba. Forcing many of its passengers off the ship, the mysterious force leads them into another room, where they reveal themselves to be the Big 5, who are the five former board members of KaibaCorp, who were fired by Kaiba before the Battle City tournament for attempting to take over his company from underneath him. The Big 5 seek revenge against Kaiba, as well as Yugi Muto for foiling their plans to take over the company on two different occasions (by defeating Maximillion Pegasus and the Big 5's Mythic Dragon in Legendary Heroes). To do so, they force their participation in their own virtual Duel Monsters tournament, in a similar vein to Kaiba's Legendary Heroes games. There was also an added stipulation: if one of the protagonists were to lose, the Big 5 also threatened to take their bodies for themselves and escape into the real world. It is also noted by the Big 5 that the virtual tournament would require virtual cards, and thus neither "Slifer the Sky Dragon" nor "Obelisk the Tormentor" could be used by Yugi or Seto Kaiba, although players could freely choose their Decks before every Duel. As the group enter the virtual world, however, they find themselves separated: Yugi in a forest near a lake, Téa Gardner in a canyon, Tristan Taylor, Serenity Wheeler, and Duke Devlin in and around a castle, Joey Wheeler in a mansion, and Seto and Mokuba Kaiba in another forest. Each of the separated groups, as it turns out, faced a different member of the Big 5. As it turns out, the Big 5 are controlled by Noah Kaiba, the biological son of Gozaburo Kaiba, and stepbrother to Seto and Mokuba. Noah had died (or, in the English dub, had his body "rendered useless") in a traffic accident when he was young, but his mind was preserved in the virtual world. He believes that, as Gozaburo's biological son, he is the true legitimate heir to KaibaCorp, and that he, not Seto, should be the one running the family business. How Noah enlists the help of the Big 5 is unclear, but it was implied that, as a result of the earlier encounter between them and the main characters, the minds of the Big 5 were similarly preserved in the virtual world (in the English dub, the Big 5 reveal that when Mythic Dragon — the monster at the end of the Legendary Heroes arc — was destroyed, so were their bodies, but not their minds). In the virtual world, each member of the Big 5 would use a different monster as their Deck Master and their personal avatar. 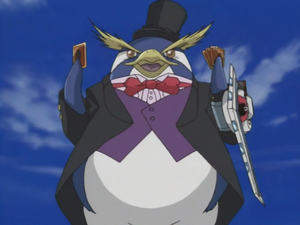 "Kuriboh" using the effect of "Rainbow Blessing"
Gansley, a businessman with a penchant of quoting famous philosophers (in the original) or business acumen (in the English dub) would be the first to Duel, against arguably the strongest of any of the main characters - Yugi. Despite wanting to choose his trusted "Dark Magician", "Kuriboh" chooses itself as Yugi's Deck Master. Forced with this choice, Yugi proceeds to Duel. Gansley's strategy to defeat Yugi was simple - by using a supposedly invincible sacrifice-and-revive combination, he could force Yugi's monsters to attack Yugi directly, without fear of being harmed. 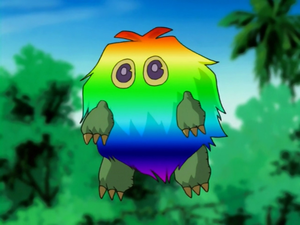 Yet, Yugi is persistent, and eventually has the last laugh - by combining "Kuriboh" (who Gansley dismissed as "weak") and "Rainbow Blessing", Yugi could set up a play which could allow a monster to bypass Gansley's defenses, and attack Gansley directly, which he does to win the Duel, using "Swift Gaia the Fierce Knight". As Yugi proceeds to find a way to reunite with his friends, Crump manages to trap Téa Gardner into a Duel. Being a competent amateur player in her own right, she chooses a Deck of all-female monsters, including "Dark Magician Girl" as her Deck Master, to which Crump scoffs at, citing it as an unwise decision, thinking that "Dark Magician Girl" would not be effective without her male counterpart (in the English dub, this is replaced by remarks suggesting a perversion towards young girls). As an additional catch, whenever either Duelist lost Life Points, part of their body would be frozen, and encased in ice. Despite being at a disadvantage for most of the match, "Dark Magician Girl" eventually helped Téa by Summoning herself to the field and using her own Deck Master ability, allowing Téa to draw the "Sage's Stone" card. With that card, Téa Summoned "Dark Magician" from nearby Yugi's Deck (thus helping Yugi to find Téa) and win the Duel. With Yugi and Téa reunited, the focus shifts to Johnson, who is slated to face Joey Wheeler. Believing he finally escaped the virtual world, and eager to get his hands on Yami Marik for what he did to Mai Valentine, Joey discovers that this was an elaborate trap set by Johnson, who proceeds to Duel him. 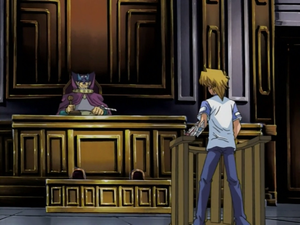 Johnson manages to get the upper hand in the Duel through a combination of his Deck Master ability, "Clear the Courtroom" (which, at the cost of 1000 Life Points, cleared the field of all cards), as well as the illicit ability of manipulating the outcome of Joey's luck-based moves. Yet, just as it seems that Joey's luck was about to run out, Noah appears and insists that Johnson forfeit the Duel for cheating. Joey, in the spirit of a True Duelist, convinces Noah to let the match continue, knowing well that Johnson would not be able to cheat again, and eventually wins by outwitting Johnson at one of the mind games he claimed to be an expert at. Tristan Taylor, Duke Devlin, and Serenity Wheeler manage to find each other, yet they find themselves faced off against Nezbitt, who wants to take Serenity's body for his own. With Tristan and Duke willing to protect Serenity from harm, they try to convince Nezbitt that they should take her place, but he settles on a three-on-one Duel. Serenity, despite having never played in a Duel herself, and knowing little about the rules, is relieved that Tristan and Duke would help her along, but miscommunication between Tristan and Duke would ultimately cost Tristan his Deck Master. Crestfallen over Tristan's sacrifice, Duke manages to use his dice tricks and his signature monster, "Orgoth the Relentless", to buy some time. Convinced by her older brother (who had managed to find her) that she, too, must fight in the spirit of a True Duelist, Serenity vows to continue playing. Serenity would ultimately deal the final blow in the match, thanks to her Deck Master, "Goddess with the Third Eye", whose ability allowed her to Fusion Summon monsters without "Polymerization", using the remnants of Tristan's playing field. With Nezbitt having technically won Tristan's body, Nezbitt uses it to kidnap Mokuba, while Yugi and friends seek to restore Tristan, who now resides in the body of a robot monkey (which is actually a brown version of "Acrobat Monkey"). Kaiba, in pursuit of Nezbitt, encounters Leichter, the last member of the Big 5. Eager to put Leichter aside, Kaiba tries to use his "Crush Card Virus" strategy against him, only to fail as he realizes that Leichter's Deck Master was "Jinzo", which renders the opponent's Trap Cards useless. Combined with "Imperial Order", a card that rendered Magic Cards useless, this left Kaiba with only Monster Cards. Furthermore, Leichter would use "Satellite Cannon", a monster that could only be destroyed by Level 8 monsters or above, and whose power increased the longer it is in play (but only while attacking), in an attempt to ensure his victory. However, Kaiba manages to Summon "Blue-Eyes White Dragon", a Level 8 monster, in time, and uses it to destroy "Satellite Cannon" and win the Duel. 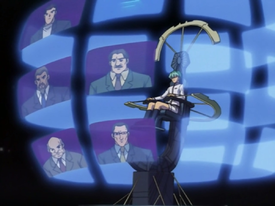 Throughout the Duel, the viewers learn of how Seto took over KaibaCorp: In the Japanese version, on Seto's birthday, he and Mokuba were given 2% shares in KaibaCorp. In the English dub, Seto was given ten million dollars; quite how Mokuba acquired 2% of KaibaCorp is never explained. In the Japanese version, Seto had to return one hundred times the investment within one year, while in the English dub, he merely had to return ten times the investment. Seto had shown his cruel business tactics when he accomplished his feat in just one day, and with that task completed, he managed to get the Big 5 into transferring their shares of KaibaCorp to Seto, so that both Seto and Gozaburo had 49% of the company each. However, Seto had blamed Mokuba for leaking the information out to Gozaburo (when in fact it was Seto himself), making Seto's attempt fruitless. When it seemed that Gozaburo had won, Mokuba then threw a bombshell of his own: he'd never turn his back on his brother, and combined with Seto's 49%, his 2% would be enough to oust Gozaburo from power. It is not completely clear what happened to Gozaburo after this; in both the Japanese and English versions he 'disappears'. Noah manages to capitalize on Seto blaming Mokuba, and convinces Mokuba through brainwashing that Noah is his true big brother, and that Seto was a nobody. This is part of his plan to slowly take everything Seto has of value from him, and the Big 5 was simply a tool for his means - by making a false promise of bodies, he could manipulate the Big 5 as he wished. Unaware of this, the Big 5 continued to try and take more bodies so that they would not have to share Tristan's, and manage to convince Yugi and Joey into a Duel with everyone's bodies on the line, in a winner-take-all duel. During this Duel, the Big 5 (who started with 8000 Life Points) manage to Summon their signature monster, "Mythic Dragon", by Tributing their five respective Deck Masters. However, it is destroyed by "Mirage Knight", a monster that was Summoned after Yugi and Joey were able to fuse "Dark Magician" and "Flame Swordsman" together (which were, respectively, Yugi and Joey's Deck Masters) to create "Dark Flare Knight", who destroyed itself by attacking "Five God Dragon" and taking no battle damage due to its effect, allowing "Mirage Knight" to be Summoned. The Duel, however, did not end, thanks to the Trap Card "A Deal with Dark Ruler", allowing the Big 5 to Summon a new Deck Master, "Berserk Dragon" - a monster that gradually weakened the longer it stayed on the field. 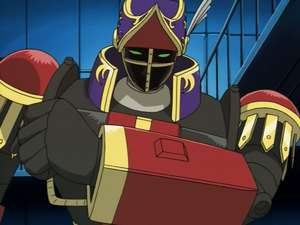 After surviving a round of attacks, Joey, who the Big 5 thought was the weaker link of the two, and was allowed to survive on 300 Life Points, would set up "Dark Magician" by transforming him into "Dark Magician Knight" by using the Magic Card, "Knight's Title", allowing him to use his Deck Master's special ability (which, he explains, would only work on Warrior-Type monsters) and was able to transfer most of the ATK of "Flame Swordsman" directly to "Dark Magician Knight", which was enough to destroy "Berserk Dragon" and win the Duel. With the Big 5 defeated, Noah banishes the five and takes matters into his own hands. He challenges Seto directly, fully intending to take his body in order to escape the virtual world, and claim the position that he believes he deserves. Noah tells Seto that he would win in seven turns, with each turn representing each of the seven days of creation (this detail, like all other religious references, was removed from the English dub). Despite Noah's choice of "Shinato's Ark" as his Deck Master, Seto manages to get into a position in which one of his monsters could attack either of Noah's two monsters and win the Duel. However, Mokuba suddenly appears to support Noah, effectively stopping Seto from attacking Noah's monsters for fear that Mokuba would be hurt. Because of this, Seto had effectively played into Noah's hands: Noah was never in any danger of losing the Duel, thanks to another of his Deck Master's abilities that gave him Life Points based on the number of discarded monsters. Now with the upper hand, Noah begins to take control of the Duel. Meanwhile, Seto attempts to get through to his brainwashed brother, to no avail. With one last hope, Seto Summons his "Blue-Eyes White Dragon", which manages to break Mokuba free of Noah's control. Yet, thanks to his Deck Master, Noah's Life Points continue to rise. 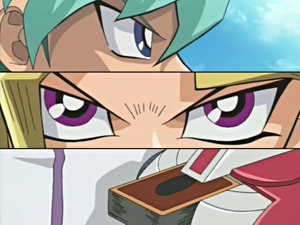 Desperate, Seto uses "Last Turn" to force the Duel into one final winner-take-all Battle Phase. Seto chooses "Blue-Eyes White Dragon" to attack while Noah chooses his Deck Master to defend. Although "Blue-Eyes White Dragon" wins the battle, the destruction of "Shinato's Ark" allowed Noah to summon "Shinato, King of a Higher Plane", a more powerful monster that destroys "Blue-Eyes White Dragon", allowing Noah to win the Duel. As a token of his victory and his apparent worthiness of the title of head of KaibaCorp, Noah turns Seto and Mokuba to stone. Yugi, however, is enraged over Noah's actions: had Seto not Tributed "Different Dimension Dragon", the Duel would have been a DRAW, since this dragon cannot be destroyed in battle (this was an error; "Different Dimension Dragon" can only be destroyed by monsters with less than 1900 ATK). Instead, "Blue-Eyes White Dragon" was Summoned so that Seto would save Mokuba (in the English dub, this detail was omitted - Yugi is enraged over how Seto had effectively been blackmailed by Noah earlier when he had used Mokuba as a human shield). 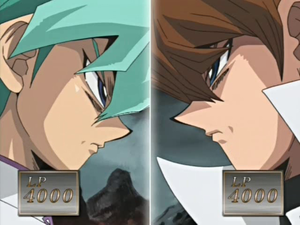 He challenges Noah to continue the Duel, with Yugi taking Seto's place. With Life Points being 7400-400 in favour of Noah, and no monsters on Seto Kaiba's side of the field (and no cards in his hand), Noah gladly accepts, intending to quickly win, and turn both Yugi and his friends to stone. Should Yugi win, however, he demands that everyone be set free from the virtual world. Having to Duel against a different kind of Duelist in Yugi, Noah uses Spirit Monsters, a type of monster that returns to the hand at the end of the turn, and the "Spring of Rebirth" Magic Card to attack Yugi and increase his own Life Points in the process. Although Yugi manages to use "Cyber Jar" to destroy all of Noah's monsters, including "Shinato, King of a Higher Plane" (which Seto forced Noah to Summon to the field as a result of Noah needing a target to declare as a defender for the effect of "Last Turn"), Noah uses another Deck Master ability to pull "Shinato, King of a Higher Plane" back to the sidelines, but with the caveat that Noah now cannot Summon "Shinato, King of a Higher Plane" back to the field for the remainder of the Duel. Because of his Spirit Monsters, "Spring of Rebirth", and another Deck Master ability, Noah's Life Points continue to accumulate to the point that Noah simply allows Yugi to directly attack him every turn - an effort that turned largely fruitless as Noah would manage to gain even more Life Points. Being confident of himself, Noah offers Yugi a chance to forfeit the Duel, but for every turn that Yugi continues to play in which Noah is not defeated, one of Yugi's friends would be turned into stone. With time running out, Yugi ends up in a situation where he has 100 Life Points to Noah's 10,000, facing off against Noah's most powerful Spirit Monster (which stayed on the field due to a Trap Card), with nothing on the field and no cards in his hand. Worse, all of his friends are eventually turned turned to stone. It seemed all but lost for Yugi, when he is reminded that even though all of his friends (Seto and Mokuba included) are turned to stone, they are still there in spirit to cheer him on. With a new-found confidence, Yugi draws "Card of Sanctity", allowing Yugi to draw six cards. With these six cards, he revives Seto Kaiba's "Blue-Eyes White Dragon" and fuses it with the two "Blue-Eyes White Dragon" he has drawn to form "Blue-Eyes Ultimate Dragon", and he uses his fifth card, "Quick Attack", to allow "Blue-Eyes Ultimate Dragon" to attack Noah's monster immediately. He then uses his final card, "De-Fusion", to split "Blue-Eyes Ultimate Dragon" back into three "Blue-Eyes White Dragons", and attacks directly with all three, winning the Duel. With the Duel won, Yugi demands that Noah free everyone from the virtual world. However, Noah reveals to everyone that, in the process of entering the virtual world, they were all knocked out and placed in virtual reality pods. Everyone is later shocked to find that it was Gozaburo, or at least, a digitized copy thereof, who had attempted to trap everyone in a complicated plan to take over the world by trapping everyone in the virtual world (in the Japanese version, Gozaburo was going to use missiles positioned in space to manipulate the world to his will). Desperate to tell the world of Gozaburo's impending atrocity, they are determined more than ever to escape the virtual world. With Noah willing to help Yugi and company despite his duplicity, they follow him to a large door that was said to be a secret backdoor that Gozaburo had not discovered and closed. However, Noah's true colors are revealed as they trap Yugi and friends within their own recent memories, although all would eventually free themselves from the trap. Meanwhile, Noah and Mokuba discover a virtual replica of Domino, in which Noah tricks Mokuba in order to escape the virtual world in Mokuba's body. Noah (as Mokuba) then aims a missile-armed satellite in order to destroy the undersea fortress (and thus the virtual world), and proceeds to leave on a helicopter alone. However, once there, he experiences a change of heart due to Mokuba's willingness to forgive Noah (and even helps convince Seto to find a way to create a new, if somewhat artificial, body for Noah), and proceeds back into the fortress, only to find the satellite controls having been destroyed by Yami Marik. With only 60 minutes until the fortress is destroyed, Noah begins working on a way to save everyone. Meanwhile, Seto, being too smart to fall for their trap, proceeds to the virtual KaibaCorp headquarters, where Gozaburo waited. Gozaburo challenges Seto to a Duel to see who was worthier of running KaibaCorp (similar to how Seto had played chess with him as a child). Gozaburo quickly finds a way to discard the five pieces of "Exodia the Forbidden One" (using "Painful Choice") in order to Summon "Exodia Necross", a monster which, as long as the five pieces of "Exodia the Forbidden One" were in the Graveyard, it is immune to virtually every card (The Left Leg, Right Leg, and Left Arm granted Necross immunities to Magic Cards, Trap Cards, and Monster Effects respectively) and grew more powerful with every battle it was involved in (Exodia's Head prevented it from being destroyed from a monster attack while the Right Arm ensured that its ATK increased by 1000 points whenever it engaged in battle). 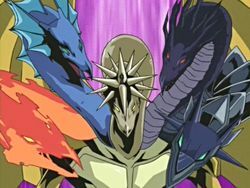 Although Exodia Necross seemed unstoppable, Seto realized that, like himself with "Blue-Eyes White Dragon" so long ago - ironically before his defeat at the hands of Exodia, Gozaburo is using the power of only one monster, believing that it alone would win the battle for him. By using the "Soul Demolition" Trap Card, Seto manages to remove the five parts of Exodia from play from Gozaburo's Graveyard, weakening it so that "Blue-Eyes White Dragon" could destroy it and win the Duel. As the countdown to impact reaches eight minutes, Joey, Tristan, Téa, Duke, and Serenity manage to escape the virtual world thanks to Noah's help, but Noah asks Yugi to stay behind to help save Seto. With everyone safely out, Noah then proceeds to put himself back in the Virtual Reality pod in order to save Mokuba and trap Gozaburo in the virtual world. Yugi and company make it back to the airship, which escapes just in time to avoid being destroyed by the missile. The airship proceeds towards the Battle City finals, completing the originally-planned trip. Meanwhile, Mokuba mourns for the stepbrother that he only briefly knew. This page was last edited on 27 October 2018, at 02:14.